With hot summer days arriving in our part of the US, it’s time to dream of escaping to the shore or the mountains. Or at least the pool. If you’re one of the lucky escapees, there’s no better way to spend a long afternoon than sipping a tall cool one. 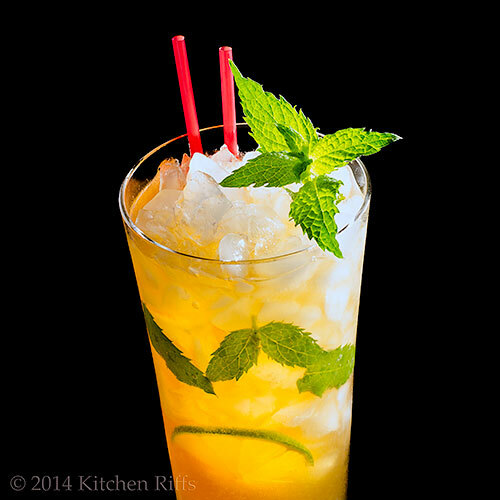 Like a Queen’s Park Swizzle Cocktail—a rum and mint delight named after an elegant hotel in Port of Spain, Trinidad. And if you’re not lucky enough to get away? Well, mix up one of these babies and treat yourself to a mini-vacation right at home. No airfare required. OK, let me say upfront that a “swizzle” and a “cocktail” are actually two different forms of alcoholic mixed drinks. So technically, it’s a bit odd (or at least redundant) to call a swizzle a cocktail. But most people today use the word “cocktail” for any mixed drink, and few know the difference between a swizzle and a cocktail (see Notes for the distinction). So I’m just going to go with the flow on nomenclature. Besides, I’m in good company—drinks authority Robert Hess calls it a cocktail too. The flavor of rum stars in this drink, so you really want to use an aged amber rum of good quality. Originally this drink was made with Demerara rum from Guyana, and that’s what I recommend. See Notes for more info. Be aware: This is a hefty drink (it contains 3 ounces of booze) and is meant to be sipped over a long period of time. If this is too much alcohol for you, feel free to reduce the amount of rum (and other ingredients). Add all ingredients (except garnish) to a tall glass—one that holds 12 ounces or more. Add a cup or so of crushed or shaved ice (see Notes). If you have a genuine swizzle stick (see Notes), use it to mix this drink. Otherwise, just use a long-handled spoon. Place the swizzle stick or spoon in the glass. Then, using your palms, twirl the handle back and forth (you’re swizzling!). Continue swizzling until the glass starts to frost (maybe 30 seconds). Top up the glass with more crushed ice. 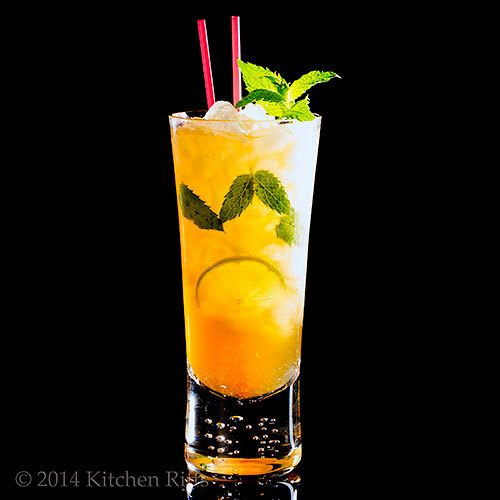 Add a mint sprig and/or a lime slice for garnish (I often poke the lime slice down into the glass—it looks pretty). Serve with straws. This drink is best when made with Demerara rum, which is distinguished by its seductive “smoky” flavor. Demerara rum comes from Guyana, and can sometimes be difficult to find. In the US, the two brands you’re most likely to see are Lemon Hart and El Dorado. Both are good. Lemon Hart and El Dorado rums both come in 80-proof and 151-proof varieties. You want the 80 proof for this drink. I used El Dorado 12-year-old rum for making this drink, and can attest that it works very well. BTW, we buy all of our booze (with our own money!) and receive no compensation whatsoever from anyone for mentioning products. This blog is noncommercial, and we’re just recommending what we like. If your liquor store doesn’t carry Demerara rum, ask if they can order it for you. Alternatively, you can order it directly from online liquor sources. Although this drink is named after a Trinidadian hotel, I don't recommend using a rum from that island when making it. Most rums from Trinidad are rather light in flavor, and really not appropriate for this drink. I sometimes change the recipe for this drink just a bit: I use 2½ ounces of rum, then mix the drink as called for in the Procedure. Then in Step 3, right after I’ve topped up the glass with more crushed ice, I gently pour ½ ounce of Lemon Hart Demerara 151-proof rum on top as a float (I much prefer Lemon Hart to El Dorado when it comes to Demerara 151 rum). I want the float to remain on top of the drink, so I usually pour it over the back of a teaspoon to help it stay on the surface. Why use a float? Because as you sip the drink through a straw, the top float layer will gradually make its way to the bottom of the glass. By the time you get to the end of the drink, much of the ice will have melted, diluting the rum. The float helps boost the flavor of the last few sips. My variation isn’t traditional, but it’s tasty. If you want to make a version of this drink that’s as authentic as possible, use simple syrup made from Demerara sugar (which is a form of brown sugar; look for it in the baking aisle at the supermarket). You can use our recipe for making Simple Syrup, but substitute Demerara sugar for white. Of course, if you don’t want to go to all that trouble, regular simple syrup works just fine! If your refrigerator/freezer has an ice maker, it can probably make crushed ice for you. But if you need to crush ice by hand, here’s a quick method: Place some ice cubes on a heavy kitchen towel, fold the towel over the ice, and whack with something heavy. How did it work? Well, the idea was that you’d put the swizzle stick in a glass (along with drink ingredients and ice) and quickly rotate the shaft of the stick between your palms so the root end would spin back and forth, churning your drink. The propeller action of the swizzle stick helped froth and chill the drink—no shaking necessary! The swizzle stick and the crushed ice are what put this particular drink in the “swizzle” family. Cocktails, by contrast, originally were quick pick-me-ups generally consumed in the morning (yes, really—but we’re talking late 18th and early 19th centuries; things were different then). Back in the day, cocktails almost always included bitters. Today, of course, we call almost any alcoholic mixed drink a cocktail. Port of Spain (or Port-of-Spain, as some write it) is the capital of the Republic of Trinidad and Tobago, a country made up of two islands in the southern-most part of the Caribbean. Christopher Columbus landed on Trinidad in 1498 and promptly claimed it for Spain. The islands later fell under the control of several competing European powers, but eventually became part of the British Empire. They finally gained their independence in 1962. The Queen’s Park Hotel opened in 1895 next to the “Savannah” in Port of Spain—a large open park in the midst of the city. At the time of its construction, the Queen’s Park was considered one of the finest hotels in the world. It was a popular destination for British and American tourists who wanted to relax in an attractive Caribbean setting. The Queen’s Park Swizzle, which probably hails from the 1920s, became the hotel’s signature drink. Alas, the Queen’s Park Hotel no longer exists. It was torn down in 1996, and an office complex was built on the site. “Whoa, this rum is awesome,” said Mrs. Kitchen Riffs, taking a long sip of her Queen’s Park Swizzle. “But with the same refreshing mint flavor,” said Mrs K R.
“Yeah, cocktails can get a little technical,” I said. what I wouldn't give for one of these beaut's right now. it's about 86 degrees here on the cape, with 100% humidity. John, you create the most beautiful drink posts. This looks awesome! If I drank, I would down a gallon of this stuff!!! And then... I would be on the floor. LOL! Now I know how to swizzle!! :) I always that swizzle was a noun, but now I know different. Well, this is on pretty drink, and yes - quite hefty, but a great drink for those summer nights, just sitting on the porch looking at the stars. Thanks for introducing me to yet another new drink John! This looks nice and refreshing, but I'm afraid that I would have to reduce the rum about (I freely admit that I am a lightweight). Having said that I do need to say that I have lots of mint in the back just waiting for a purpose. Looks like it is my lucky day. A glamorous drink that I would really love right now......isnt it awesome that we are no craving these coolers? That photograph is a killer. Magnificent photos and quite refreshing cocktail! It made me thirsty! Thank you so much for sharing, John. I sure wish you would "bring" one of your cooling cocktails or dishes to the Picnic! Hi John, what a great post, lots of info, history and then a nice conversation with Mrs. Kitchen Riffs. It's almost 3 in the afternoon and I'm thinking about one of these drinks. Sounds like a perfect summer, lazy afternoon or evening treat! It looks SO refreshing! Hi Dawn, we're about 8 degrees warmer -- it's hot! Drives one to drink, doesn't it? ;-) Thanks for the comment. Hi Pat, I must say I enjoy doing drinks posts -- the research is so much fun! ;-) Thanks for the comment. Hi GiGi, a gallon of this would put you under the floor! Thanks for the comment. Hi MJ, swizzle is a noun too; isn't English fun? ;-) And this is a great porch drink. Thanks for the comment. Hi Ray, this really is such a great summer drink -- tons of flavor, and takes a long time to finish. Thanks for the comment. Hi Karen, I'll be having at least one more drink that requires mint coming up this summer. ;-) But this really is a strong drink, so cutting it down isn't a bad idea. Thanks for the comment. Hi Minnie, these slow sippin' drinks really hit the spot right now, don't they? Thanks for the comment. Hi Nee, I'll definitely be stopping by next Sunday! With a Queen's Park Swizzle in hand. ;-) Thanks for the comment. Hi Denise, isn't this a nice drink? Makes me thirsty just thinking how refreshing it is! Thanks for the comment. Hi Louise, I'll have to see if I can get organized enough to do the right cocktail at the right time for the picnic. And the rum in this is really nice -- definitely worth trying sometime. Thanks for the comment. Hi Cheri, it's definitely swizzle time! ;-) Thanks for the comment. Hi Chris, it really is a great treat for summer. Definitely refreshing! Thanks for the comment. That would be wonderful John. Please let Mrs. K.R. she is more than welcome to join in on the festivities! I need a Swizzle Cocktail !!! Hi Carolyn, two would be just the right number to make me senseless to the heat. ;-) Thanks for the comment. Hi Zoe, don't worry, soon enough it'll be warm again, and then it will be swizzle time! ;-) Thanks for the comment. Thanks for educating us on swizzles!!! It is perfect swizzle weather..and I'm so glad you have the antidote!!! Now this swizzle, I could really swizzle! Or cocktail. Or whatever! Truly, I love this one. All flavors that I really enjoy! Plus i still have some mint that hasn't sizzled away. Perfect to turn into a swizzle! Hi Liz, it definitely is perfect swizzle weather. Which means I think I'll swizzle this weekend! ;-) Thanks for the comment. Hi Abbe, this is really good -- Demerara rum has such a nice flavor. And I think it's impossible for mint to swizzle away -- heck, it'll even outgrow the rabbit's appetites! ;-) Thanks for the comment. Staycations with this cocktail will become my favorite kind! Very refreshing, John--thanks for sharing this. John, I love the sound of this... such a unique combination of flavours... perfect for summer! Cin cin. Seeing this, I suddenly felt my thirsty!! This looks really good! A fabulous cocktail! So summery and delicious. Really love this drink, John! I always enjoy rum and need to use it more. I always enjoy your bits of trivia as well. Always informative. Never knew the origins of the term "cocktail". Great post! 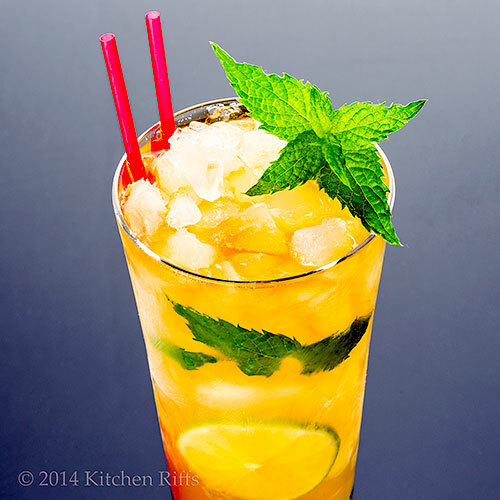 I love drinks like this that are just sweet enough (and that include mint, I love the mint)! Such a great time of the year for this, too. Thanks, John! Hi Ala, this would be a great treat while you bake some of your goodies! ;-) Thanks for the comment. Hi Bizzy, it really is a great drink. And although OK in winter if you want something with a lot of volume, really nice for beating the heat. Thanks for the comment. Hi Deepa, ;-) Glad you enjoyed this, and thanks for the comment. Hi Peachy, this is perfect for quenching a thirst! Thanks for the comment. Hi Rosa, this is wonderful for summer. So tasty and refreshing! Thanks for the comment. Hi Kumar, this really is a drool worthy cocktail! And a pretty one, too, which is always nice! Thanks for the comment. Hi Kristi, this would be perfect for one of those sunny Seattle days! Or it'd lift your spirits when it's gloomy. ;-) Thanks for the comment. Hi Bill, I could write pages about the origins of the cocktail. Thing is, no one really knows for sure how it got its name. So that means there's loads of room for speculation! It's just easier to call every mixed drink a cocktail, even though it's not technically correct (at least everyone knows what you mean). Thanks for the comment. Hi Kristy, the mint is nice in this! And the drink does taste better with a bit of sweetness, although just a touch (and I'm someone who likes drinks quite dry usually). Thanks for the comment. Is demerara rum related at all to demerara sugar? Just curious. However, the last thing I want to do is escape the heat. I'm already dreading winter. Hi Carol, there are loads of good cocktail books out there (look for David Wondrich, Gary Regan, Robert Hess, Dale DeGroff -- and I've just scratched the surface). But I'm not the ideal person to ask to invent a drink -- I really like the old recipes, and rarely make my own (as opposed to food recipes, where I frequently develop new recipes). Thanks for the comment. Hi Laura, Demerara is a region in Guyana, from which came both the rum and the sugar. Essentially the sugar is minimally processed, and although named for Demerara, now usually comes from other sugar growing countries. Thanks for the comment. I would love an escape to somewhere exotic! These rum drinks make me want a vacation! It isn't often I read about a country that I know nothing about, but you've done that to me with Guyana. I had no idea rum - or sugar - came from that country. Time to do a little google research! Hi Alyssa, yeah, rum drinks really put me in a vacation mood too! But we can make one at home and call it a vacation. ;-) Thanks for the comment. Hi Beth, Guyana really does produce some great rums -- worth getting to know. Thanks for the comment. Hi Terra, yeah, I know about the name thing. You really do need some bitters! They're so good. Thanks for the comment. Hi Maureen, heck no! Just make yourself one, and go sit by your pool. Even if you do need to bundle up. ;-) Thanks for the comment. Hi Ashley, hot here too - mid 90s! Too hot for this early in the year. Thanks for the comment. Summer here too in Spain. For some odd reason, I seem to be craving cocktails ever since starting chemo so this one is on my wish list. Hi Bibs, sorry to hear about the chemo! My mom went through that too -- no fun, I know. I think cocktails are a perfectly sensible reaction to chemo! Thanks for the comment. This sounds so refreshing right now, since it's 93 with 85% humidity. And your photos are gorgeous! Hi Greg, :-) Thanks for the comment. Hi Pamela, hot and humid here too! Although we had a big thunderstorm last night, so decided to have a Dark and Stormy. ;-) Thanks for the comment. Louise and Nee told me that it was your birthday! Just want to wish you a happy one and to enjoy with your friends and family. I have not visited before, but will from now on. I love your posts and your photos are delightful. I love the cocktails and your stories. So enjoy the day! Will be chatting soon, I hope..
Dottie :) from "Family Plus Food Equals Love"
Hi Cathleen, this is definitely worth tasting. ;-) Thanks for the comment. Lovely and looks so refreshing :) It is getting hotter and hotter and we are supposed to travel to Egypt by mid July, and the weather there is like you are standing in front of a 600F oven :) . Great pictures John. Hi Amira, I've never been to Egypt -- would love to go sometime. What wonderful history, and so much to see. Thanks for the comment. Hi Charlie, you could probably use another vice or two. ;-) This really is a lovely cocktail. Thanks for the comment. John, ya never know. You might invent your own 'classic' for someone down the road of time. I am smiling as I am typing this. Thanx for the book tips. I made note of them. I would love one of these in hand by the pool right now!! Hi Kristi, this is a perfect pool drink! Thanks for the comment. Hi Raymund, it really is refreshing. And it's been hot here, so we need refreshing. ;-) Thanks for the comment. Hi Bam, this is such a fun drink, and perfect for the pool. And yes, 151-proof rum really needs to be used cautiously! Thanks for the comment. John this sounds like my k d of drink - sweet and tasty and so pretty too! Hi VIcki, this really is a nice drink -- loads and loads of flavor. And very refreshing, something we need in this weather! Thanks for the comment. Looks great. Is the color because of rum? I dont know if I can find this rum in Turkey but I might ask my husband to search at the duty frees when coming here. Another winning drink, John! I love any sort of drink that contains mint, especially when it is hot outside. The mint always makes them extra refreshing and tasty! Hi Ilke, the color is indeed from the rum. I'll be interested to hear if you can find this rum in Turkey. If rum is popular, I imagine you can. Duty free would be a great place to look for this, I'd think. Thanks for the comment. Hi Amy, mint is so nice in drinks, isn't it? And (as usual) our mint is growing like a weed, so we need to find ways to use it! Thanks for the comment. This cocktail sounds wonderful. I could see myself sipping on one of these this summer. Hi Dawn, this is a great summer drink -- we've had it a couple of times this summer, and the summer is still young. ;-) Thanks for the comment. I'm one of those lucky ones having escaped to someplace tropical with a pool and an ocean :) I need one of these to drink by the water! Hi Ashley, lucky you! You definitely need one of these to help you enjoy. ;-) Thanks for the comment. How did I miss this one, mon? Jamaican mojito? Yes and thank you, please. Hi Debra, this drink is very much like a mojito! And awfully tasty. Thanks for the comment. Hi Nami, hot and humid here in St. Louis, so we're drinking long tall sippers. Thanks for the comment. True that. I went looking for some Demerara rum in our local liquor shop. They didn't have any, but said they would let me know if they get some. Hi Minnie, you need to find a better liquor store! Actually, liquor laws are so weird -- they vary so from state to state, and what you can find in one state, you can't in another. Up until about 2 years ago I had to order Demerara rum from a mail order place, but now my liquor store stocks it. Go figure. Hi Uru, you definitely need to get some Demerara rum -- it's soooo good! As is this drink. ;-) Thanks for the comment. Hi Kiran, this is a perfect drink for watching the world's cup! A nice slow sipper to contrast with all the speedy players. ;-) Thanks for the comment. You make the most amazing drinks ever! I could so do with one of these right now! 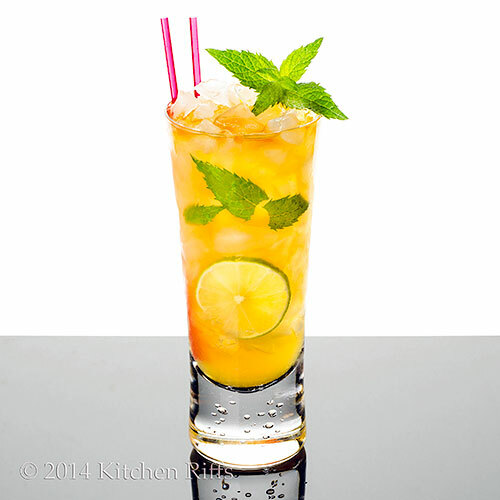 Hi Asmita, this really is a fun drink -- loads and loads of flavor! I love the mint in it! Thanks for the comment. Hi Dana, isn't this nice? Very refreshing, and with such terrific flavor! Thanks for the comment. Yes please!! This is a cocktail for me. You've done it again. I think I need to print out all your cocktails and leave a list by our liqueur cabinet of ones I need to try... better yet, why don't you just bring out a book already. Hi Amanda, lol! There's probably almost a book's worth of cocktails on the blog already! Well, a very short book. ;-) Thanks for the comment.